It’s not like I’ve been putting this off, but with Guaranda and all, I just got side-tracked. Though now that I’ve just finished my 5th week in a Spanish language immersion program, it’s time for a review. I just ended one program and I’m set to begin a new phase. Firstly, I have to say goodbye to Raquell Dávalos, my cultural, historical, environmental, and, when I couldn’t avoid it, Spanish teacher. Raquell has headed off to a teaching contract in El Oriente (the Ecuadorian part of the Amazon headwaters) for 2 weeks. All the best Raquell! It was 5 weeks of in-depth exposure to the wonders of Quito. I could not have hoped for a better profesora. OK, really, it is now time to buckle down and truly feel, not just know intellectually the difference between Por y Para , the rough Spanish equivalents to the English For. Wait! Let’s put it off some more; first let’s take time for some diversion. I can always study later. I’m going to meet Frank, coming in from Albuquerque late tonight, and we’re headed to the southern part of the country for some genteel mayhem. It will have to be toned down simply because I’m sporting a plaster cast from mid-calf to my toes on my left foot. I broke the outside metatarsal by looking up when I should have been looking down. So, with cane in hand, I lead Frank to Cuenca, Ecuador’s 3rd largest city. Like Quito, Cuenca is a World Heritage Site, selected for it’s colonial architecture, postcard setting, many museums, and because it’s just simply a beautiful place. More of Cuenca later, in a separate post. I stumble back in a week to change my program at the school. 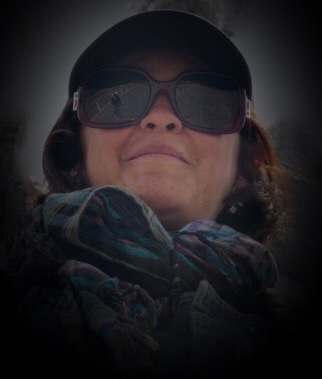 Since starting at Terracentro in the beginning of February, I have been enrolled in “Cultural Quito” a stunning introduction to the charms, secrets, and thousand year old history of this amazing city. This program puts the student in class, one-on-one with an instructor in the mornings, then during the afternoons we were riding buses, taxis, and mostly walking in, through, and around some of the museums, markets, churches, cathedrals, historical sites, and so much more, both in and also near to Quito. It’s a good program; no, it’s a great program, but really it was not right for me. And I knew it even before I left Honolulu. So sue me, that’s the way I am: if moderation is good then it stands to reason that overindulgence must be better, right? Tell that to the broken metatarsal. It’s been almost 3 years since I bowed out of Spanish classes in Albuquerque: to first remodel the house, and then to sell it to return to Honolulu. Three years is a disastrously long time to be away from a 2nd language that I had certainly not mastered before the hiatus. I knew this, but the thinking was that I would only be in Ecuador for a month or 2 and I wanted to pack as much as I could into that time, so taking a cultural program without remembering basic grammar was a good thing, no? Ahhh, No. I have no real idea how Raquell put up with such a poor student other than because of her deep love for her native Quito. And the fact that she shares a cynical view of the world. If this old gringo wants to blow his money by tripping over first-semester verb tenses, at least we can have fun. So we did. Every day for 5 days each week for the full 5 weeks we saw something new and wonderful. Which was after she made me pay for it by squirming from her stare in the classroom. She’s got a certain sadistic side that hides behind an innocent smile, a smile that speared me daily with questions about how could I possibly ever think to use a first-person present tense ending on a 3rd person past tense verb? Even children don’t speak like that! Yet in spite of myself I have made progress and look forward to the new program. I will spend 5 or more hours in class each day with no more sight-seeing, so that I can really build a strong grammar base to use in this truly expressive language. ¡Que Bueno! Two weeks into my cultural program I realized that I need to be in Ecuador for more than the standard 90-day visa allowance. The culture, the language, and most importantly, the people of Ecuador demand (though politely, to be sure) a deeper commitment from me. And I willingly accept this, so I am working with a lawyer to extend my visa to 180 days. Will that be enough? Of course not, but I really do want to see other Andean countries too. The other part of an immersion language program expects that the student will live the language outside the classroom, and what better way than to live with a family? In my case, I believe that I have the best of all worlds, since I live right here, at the school, with the Director’s parents. Carmen and Hector Villacís are about my age and they have both welcomed me into their home, into their kitchen, and I dare say into their lives. Carmen is a retired banking officer and Hector is a journalist, a Periodista. Having lived in Long Beach, California for several years while earning an accounting degree, Carmen speaks pretty good English and we, against the rules, often default back there when my Spanish flounders. We spend breakfasts and dinners here at the kitchen table, while I go out for lunch on my own. She’s an avid listener to talk radio, and it’s usually the basis for a protracted breakfast, with heated discussions along the way. Strong into women’s rights, she has little patience for weak-willed, macho politicians. And let’s me know it, often. Hector, who teaches an advanced arts and politics program for his daughter’s school, speaks no English. Yet somehow, he and I have had any number of 3 hour discussions with both of us enjoying them immensely. He is widely traveled, particularly through Latin America, and has worked for 40 years in radio, in television, and with the printed word, spending decades both in front of and behind the microphone. He has a life-long love of the arts and knows Shakespeare and Tchaikovsky and Velázquez far better than most. He currently writes for a political publication and here in Ecuador these days, that’s not easy. Well, that’s what I do with my time for the most part. Yet I haven’t explained how I chose Terracentro, one school out of 200 Spanish schools in Quito. And that’s because I haven’t told you about the South American Explorers Club. That might have to wait until after the Cuenca post. This entry was posted in Uncategorized and tagged Cotopaxi, health, Quito, SAEX, Spanish language on 2015-03-06 by kmalivuk. …Aahh, good to know that our family trait of procrastination didn’t end with me (the “real” reason I write Sunday’s sermons on Saturday night)! Hope the foot heals in time for more lively explorations with Frank. Keep the posts coming, we all enjoy them. BTW, heard from Dave and Valerie and she’s having a girl. Hi Rick. A rationalization that I’ve been comfortable with argues that if you do something too early it might go stale before it’s due, so why take a chance? I heard about the new grand-niece just before I left, though I haven’t heard anything from Dave since. I sent him this blog link, but I’m not sure if he stops by. A few days ago I heard from both Shanon and Mike on the same day, that was pretty neat. Dave has the link but admits he’s been jumping thru a lot of hoops to get his new job (which he just started and loves…gets paid to take people to museums). I’m sure you’ll hear from him soon. Karl, many of us in Eunice’s yoga class also are enjoying your posts – and I’m getting pretty envious of your total immersion into Ecuador’s culture. Ouch! Any idea when the cast can come off? Thoroughly enjoying the posts but sorry to hear about your mis-step. Wow Karl, what an adventure you’re living, we are all jealous, and happy for you (except for the metatarsal of course)! Love the pictures and am now caught up. I just landed a job and have been working 10 -12 hour days (retired you say, part time you ask – Bahh!!). Hope you heal quickly but it doesn’t sound like your injury has slowed you down much. In any case, I’ll be staying tuned! Dave; I’m glad to hear that you’re contributing to the local economy. It sounds like a great way to earn some walk-around money and provide a necessary service. I’m sitting in the lobby of Hotel Cotopaxi, waiting for breakfast in the pueblo of Latacunga. Frank and I hope to make Cuenca by lunch and expect to spend several days there scouting the town as a possible re-location site. Who knows? Hi to Candace. Hey Uncle Karl! Thanks for the blog, we can now travel vicariously through you. Look forward to reading more. Hi Matt, it’s great to hear from you. Have you set up your practice? It means a lot to have you tuning in. All my love to Denise and the boys; and you too! Another fascinating entry. Sorry to hear about your injury. Out of curiosity, how are the medical services? Is it socialized medicine? I developed strep fever while visiting Jamaica (not quite parallel with your location) and when we asked the physician (who was wonderful) what we owed, he told us whatever we felt they deserved. Amazing! Keep writing and learning. Hi Shanon. It’s definitely profit driven here. But, the bill for everything including emergency service, X-rays, an orthopedist, the cast, a follow-up with the orthopedist, AND THE REMOVAL!! (this past Monday) came to less than $500.00. I have Plan F with my Medicare Supplemental and they claim that I have a $20k foreign shores coverage, so I may even get all this back too. If I was a foreign national living here permanently, the bill would have been half this because they have half-off everything for senior citizens. I was very fortunate that my teacher accompanied me to the private clinic/hospital and bulldogged her way to the front of the line at the Emergency desk. As it was, from going in the front door to driving to a med-supply for the cane and slipper, I was back at the school within 5 hours. Next time you get sick overseas, do it in Quito. Hi Karl, Just today in yoga class someone mentioned that you hadn’t posted in a while. And then this new post. We will all be buzzing about it on Sat. You would be surprised at how many look forward to your posts. I know I do. And all agree you could be a great travel writer, maybe this blog is the precursor for this! So as we spring into spring you will fall into fall. Wonder if you will start seeing colors of fall. BTW I loved John Oliver’s bit on the president. Hey Marilyn, you provide my fuel, thanks! While out of town and on the road I do get behind. This Saturday I will be back at the South American Explorers Club (SAEX) for a monthly Meet-Up and I expect to post something about the Club and how it is such a great resource. 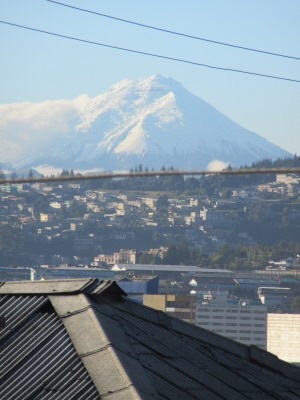 While Quito and Ecuador itself witness seasons, they are nothing like I’ve seen elsewhere. Yesterday, 40 miles south of the Equator, I was wearing a wool watch-cap, long-johns, and fingerless gloves (it’s hard enough to type on this 6-inch keyboard). Quito is in the midst of a frigid winter but the leaves don’t change and they don’t fall off either. It doesn’t freeze, but the cold is intense. I look forward to the Meet-Up at SAEX because the also have and use a great fireplace.